The U.S. space agency NASA announced Sunday the launch of a Soyuz spacecraft from the Cosmodrome in Kazakhstan that is transporting three astronauts to the International Space Station. NASA astronaut Sunita Williams, Russian cosmonaut Yury Malenchenko and Japan’s Akihito Hoshide will travel for two days before meeting up with colleagues aboard the ISS, where the team of astronauts is tasked with carrying out numerous experiments. In a statement released before liftoff, astronaut Sunita Williams, the only female traveling on board the spacecraft, said her only regret is that the mission will not last longer. “Unfortunately our mission is only four months—I wish it would be years and years and years. I’m really lucky to be flying with Yuri and Aki. I think we’re going to have a great time,” said Ms. Williams. 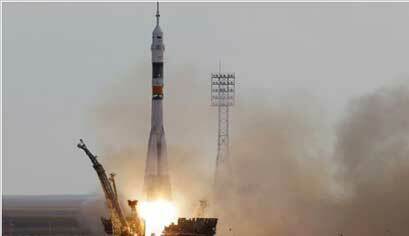 The Russian spaceflight was grounded last year after several launch accidents affecting cargo craft and satellites. Sunday’s launch is the latest to take place for NASA, which after a series of budget cuts retired its shuttle fleet earlier this year. Since then it has had to rely on the Soviet-era Soyuz as governments and private companies scramble for new ways to launch humans to the station and beyond. In a statement released from NASA headquarters, officials said the mission is likely to remain on track and should go smoothly. Ironically, today's launch took place on the 37th anniversary of the landmark Apollo-Soyuz mission.